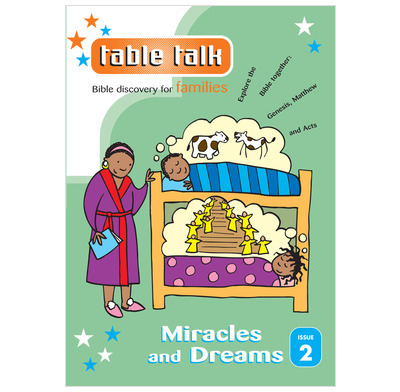 Issue Two of Table Talk is called Miracles and Dreams. It contains three months of Bible readings based in the books of Genesis, Matthew and Acts. The pages are undated. It will help you explore Jesus' miracles in Matthew's Gospel, meet Jacob the Schemer and Joseph the Dreamer in Genesis, and discover why Peter's dream changed everything for the first Christians. Day 21 gets us back into Genesis and by day 30 we've covered chs 25-33! Days 46-65 go back to Genesis to find out about Joseph in chs 37-50. I do table talk over breakfast with my two boys, 5 and 3. It provides a very good simple structure that works quite well as part of a breakfast routine. The plans are clear to read for parents, and make it easy to be flexible according to the child's age / capability. We've been using it for 6 months now, and it's still working well. I also like the way that big truths are tackled in simple ways. We are a couple of weeks into using tabletalk and my 4+6 yr old like it alright. I do it with them while they're having their breakfast and involves reading 3-4 verses from the bible along with the days notes in the booklet. Occasionally it suggests extra resources like an atlas to show where the places are that are mentioned in the reading and sometimes they suggest extra things like doing a little sketch together. You do as much or as little as you want.